Carrots are root vegetables that are usually a bright orange with a sweet juice that is not only a wonderful beverage, but also highly nutritious. A glass of carrot juice normally contains about 80 calories and can serve as a nutritive alternative to the usual glass of water. 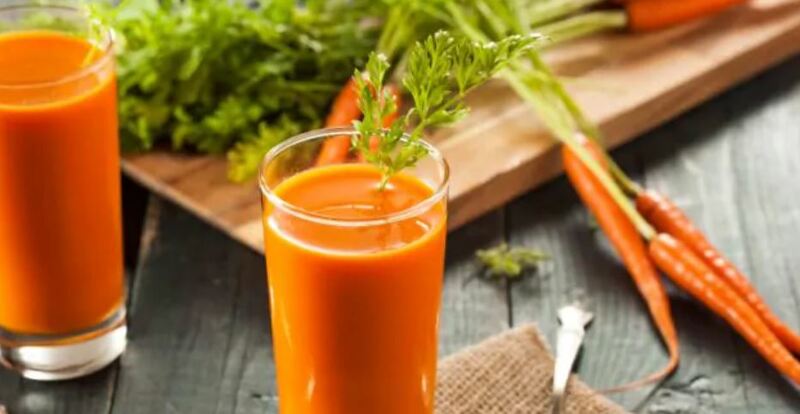 You can include a carrot juice recipe as part of your diet plan to be an alternative to beverages like soda, which contain excess calories that keep you from shedding off the weight you are probably trying so hard to lose. Carrots have many significant nutrients besides a low calorie count. Beta-carotene and lutein is present in large quantities in carrots, which is converted to Vitamin A. When Vitamin A gets to the retina of the eye, it becomes rhodopsin that helps improve night-vision.Research has also shown evidence that carotenoids in carrots have helped reduce significantlythe risk of breast cancer after menopause. It has also been proved to help reduce by at least half, the occurrence of cancer in the bladder, prostate, larynx, colon, lungs and cervix. A glass of carrot juice some minutes before a meal can be a wonderful appetizer, too. You might be amazed at how sweet carrot juice is, if you have never had it before. The beauty with carrot juice is its versatility when combined with other vegetables or fruits. For a healthy and nutritious carrot juice recipe, you need to cut up the carrots into small pieces so that they can go into your blender. If you are using a juicer, then you may use them as they are. You will need at least six carrots to make a glass of carrot juice. If you will be blending the carrots, then a little water can be added to smoothen the blending. You can mix with parsley, apples, lettuce, beetroot, spinach, bell pepper and even tomatoes, just to mention a few. Put all the ingredients in a juicer (here is my be﻿﻿st﻿﻿ juicer choice) and allow enough time to juice. Your carrot juice will be ready within 5 minutes. You can sieve or if you prefer to take it together with the pulp, just do it. I like it that way. Best juice recipes books -You never need to search for juice recipes anymore.